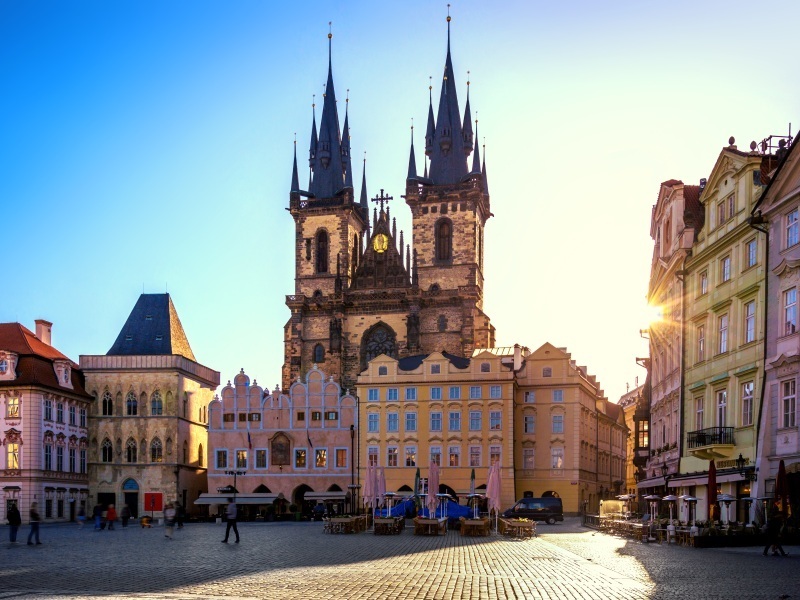 Experience the breathtaking Bohemian capital of the Czech Republic, the beautiful Pearl of the Danube and the great Imperial capital of the Habsburg Empire, and pay a visit to striking, Slovakian Bratislava, as we reveal some of Europe’s greatest cities on our great-value tour. Flights also available from other UK airports – Birmingham, Bristol, East Midlands, London Gatwick, London Luton, London Stansted, Manchester – click here for more information on available dates and prices. Join our walking tour of Prague to see its exquisite Old Town. Cross the River Vltava, by the Charles Bridge, to the Hradcany district dominated by the imposing castle, great St Vitus’ Cathedral and the historic Royal Palace. Afterwards, go exploring – perhaps in the city’s many museums and galleries. Today we head through the forests of Bohemia to the Slovakian capital Bratislava, a cosmopolitan city of Baroque palaces and stunning churches. After a chance to explore, and our first glimpse of the ‘Blue’ Danube, we continue to Budapest where you can enjoy an evening visiting the famous cafes. Budapest is in fact two cities set astride the majestic Danube. One ‘half’ is Buda, an elegant hillside of opulent buildings. Discover the medieval houses of the castle district, the frescoes in medieval Matyas Church and the spectacular views from Fishermen’s Bastion. The city’s other ‘half’ is Pest, a bustling hive of museums, galleries, thermal baths, restaurants and bars. See the Gothic Parliament beside the river and the colonnades and statues of Heroes’ Square. You’ll will also enjoy a Danube River Cruise and, later, have the chance to join our optional folklore evening to enjoy traditional Hungarian food and music. This afternoon we reach Vienna, capital of the Habsburg Empire and site of the world-famous Hofburg – home to the Spanish Riding School and the Vienna Boys’ Choir. See the Baroque palaces, the cathedral and many museums, and wander the elegant arcades and famous Ringstrasse. Join today’s optional excursion to the Schonbrunn Palace. The magnificent building was an Imperial summer home, and its great apartments and opulent saloons once echoed with the music of the young Mozart. Alternatively, experience Vienna’s charms, such as the famous Landtmann Kaffeehaus once frequented by Sigmund Freud and Gustav Mahler. Today we return to Prague through the wonderful South Bohemian countryside. This evening, why not take to the River Vltava for our optional dinner cruise and a final opportunity to enjoy Prague’s stunning monuments? It’s a perfect way to end a wonderful tour.